The design of this charming console make it highly functional and stylish. Use as a buffet, entertainment console or accent cabinet to keep your things organized or infuse style into your home. Three drawers and four doors are adorned with wooden knobs along with decorative crossing along clear glass door inserts to coordinate with the rubbed finish. 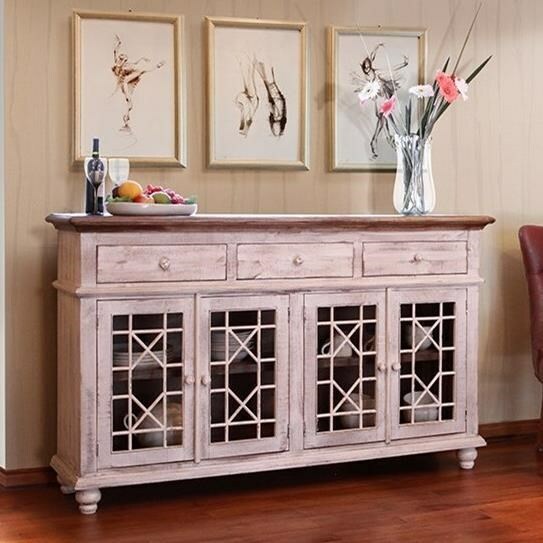 Hand turned feet and angled mouldings complete the rustic look of this beautiful cabinet. The Vintage Primitive Console with 4 Glass Doors by International Furniture Direct at Miskelly Furniture in the Jackson, Pearl, Madison, Ridgeland, Flowood Mississippi area. Product availability may vary. Contact us for the most current availability on this product.